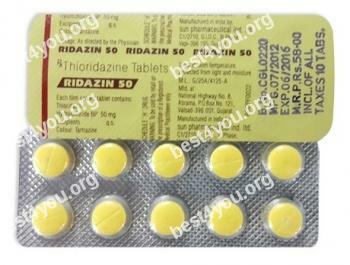 Thioridazine is used to treat psychotic disorders such as schizophrenia. It changes the actions of chemicals in your brain. Its active component is thioridazine and it belongs to a group of medicines to so called phenothiazines. It is used to treat psychotic disorders such as schizophrenia. It changes the actions of chemicals in your brain. Take the medicine as prescribed by your doctor. Take it with or without food. Take with food to reduce stomach irritation if stomach upset occurs. Continue to take the medicine even if you feel well. Use the medicine with caution. It can cause dizziness, drowsiness or lightheadedness. Avoid taking alcohol. Sit up or stand slowly. Avoid situations where injury could occur because of fainting. If chest pain occurs or worsens contact you doctor. If you have to have any surgery, tell your doctor that your are using Mellaril. Elderly patients can be more sensitive to its side effects. You should not use it if you have allergy to it; you have a decreased level of consciousness, severe high or low blood pressure, low levels of potassium in the blood, abnormal heart function test (ECG), or a history of certain heart problems (eg, irregular heartbeat, congenital long QT syndrome); you have a genetic problem that leads to decreased levels of the P-450 2D6 isozyme in your body; you are taking antiarrhythmics (eg, amiodarone, quinidine), cisapride, dofetilide, H1 antagonists (eg, astemizole, terfenadine), pergolide, pindolol, propranolol, sparfloxacin, selective serotonin reuptake inhibitor (SSRI) antidepressants (eg, fluoxetine, paroxetine, fluvoxamine), streptogramins (eg, dalfopristin), or medicines that may affect your heartbeat. The most common side effects are bizarre dreams , constipation, agitation, diarrhea, dowsiness, dizziness, stuffy nose, dry mouth, vomiting, loss of appetiate. Severe side effects include: severe allergic reactions (rash; hives; difficulty breathing; tightness in the chest; swelling of the mouth, face, lips, or tongue); changes in menstrual period; changes in sexual ability; chest pain; confusion; dark urine; difficulty swallowing; drooling; fainting; fast, slow, or irregular heartbeat; fever, chills, or sore throat; hyperactivity; involuntary movements or spasms of the arms, legs, tongue, face, mouth, or jaw; mask-like face; muscle restlessness; restlessness; seizures; severe or persistent dizziness; severe constipation; shuffling walk; sleeplessness; sore mouth or gums; stiff or rigid muscles; stomach pain; sweating; swelling of the hands or feet; trouble urinating; unusual bruising or bleeding; unusual eye movements or inability to move eyes; unusual mood or mental changes, including lack of response to your surroundings; vision changes; weakness of arms or legs; yellowing of the skin or eyes. Symptoms of overdose are seizures, sever drowsiness, muscle spasms, deep sleep or loss of consciousness; fast, slow, or irregular heartbeat; tremors; trouble urinating; twitching. Store it at room temperature, between 59 and 86 degrees F (15 and 30 degrees C), in a tightly closed container. Store away from heat, moisture, and light. Do not store in the bathroom. Keep it out of the reach of children and away from pets.